Could Hugh Jackman join the Avengers? Is Star Trek 3 filming in 2014? At least, Hugh Jackman wants to see it happen. Plus there are hints about how Thor 2 and Dr. Strange will fit into Marvel's movie universe. Check out a new Elysium featurette. Steven Moffat explains how Matt Smith and David Tennant will get along in the Doctor Who anniversary special. Plus new looks at Gravity and Catching Fire. Spoilers ahead! Kevin Feige, speaking to pump up Marvel's panel at Comic Con this week, spoke a little about the goals for the next Thor film: "We wanted to see more of Asgard than last time... We see the street-level view, the nooks and crannies of house people actually live there―real people and not just golden superbeings." A few script pages from the rumored Doctor Strange movie have supposedly turned up from an inside source. As with other recently rumored Doctor Strange script pages, these should be taken with all the grains of salt. In any case, the pages come from a script codenamed Eye See You, and they are pretty heavy on Marvel Cinematic Universe continuity. In the pages, Nick Fury and SHIELD detect strong power readings from a Tibet mountain. A mysterious person in the room with Fury says he can see a green radiation coming from the mountain, and asks Fury whether the radiation is terrestrial in origin. Fury says it's still being analyzed, but he hasn't seen a power surge like this since Bruce Banner's original Gamma Ray accident. The Black Widow is in the vicinity and will investigate. Star Trek 3 should be filming, I suppose, next year. It’s going to be made a lot quicker than the last one. That’s the plan, although nothing is confirmed yet. Mate, I ask the same question. I literally asked the same question the other day to Tom from Marvel who works with all the other studios, he works with Sony and Fox, that’s his job to liaise. I said, ‘Man, can this happen?’ and he goes ‘Look, it’s not gonna be easy because you’re working with different studios and they’re their properties.’ But I believe — maybe I’m optimistic, I understand at Marvel they’ve got The Avengers, they’ve got a lot of big things going on, but at some point I just find it almost impossible that there’s not a way to bring Iron Man, all the Avengers characters, Wolverine, the X-Men characters, Spider-Man, and somehow get them in together. Bryan Singer tweeted this photo with just the caption "Man on wire." 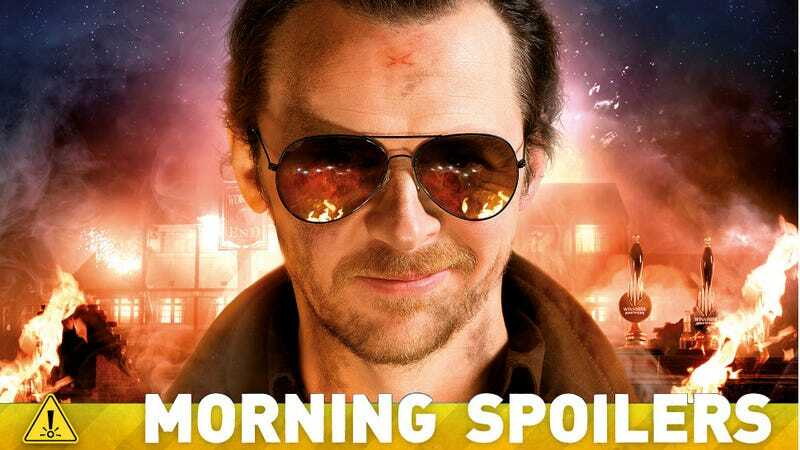 Edgar Wright explained to The New Zealand Herald about the difference between this film and his previous two collaborations with Simon Pegg and Nick Frost: "The difference with this one is that the actual character comedy is a little more honest and frank. I'd say it is both darker and also sillier, which seems like an odd combination, but I think when you see the movie, you'll see why." Aside from all the sci-fi mayhem, it is a cautionary tale about not looking back. There's that phrase, 'You can never go home again' - I think a lot of people have been through that experience, whether it's going back to a home town or going to a wedding or a school reunion where you reconnect with old friends - it's always bittersweet. We came up with this idea about five friends, four of whom have become adults and one person who wants to be a teenager forever, and him trying to recapture that - not even glory days, but one glory night. And you know, the sting in the tail is that he gets a wild night of a different hue. He's one of Asia's top stars in the worlds of music, television and movies and has become one of the most influential entertainers in China. Now he’ll also be known for Transformers 4. Welcome Han Geng to the cast of Transformers 4. Well, when you’re talking to yourself, there’s no filter! You don’t spare yourself! They’re quite a fun pairing, I would say. There’s a bit of the normal joshing of each other but they’re both such enthusiastic Doctors. While they might be sort of competing slightly, they’re both standing there saying, “Oh god, it’s so cool, there’s two of me!” So, it’s very different. I think the other one that worked brilliantly was Jon Pertwee and Patrick Troughton. They were incredibly funny together. This is very different from that but it’s a sublime double act. While the Governor is still out there and still a threat, we're going to see him in a new light and he won't appear until we least expect it. I don't think people are really going to be able to anticipate what we do with the Governor; it's going to be radically different. Once that story unfolds over the course of this season, people will see this is averydifferent story from season three and we are breaking some new ground with these characters. In our tale, Dracula and Van Helsing are actually partners. They’ve partnered up to fight a bigger bad, which is called The Order of the Dragon, a secret organization. This is an order of right-wing zealots who cursed Dracula and turned him into a vampire years ago. We flash forward to today, to Victorian England where Dracula has assumed the alter ego of an American inventor by the name of Alexander Grayson. He has come to England to essentially avenge the fact that he was turned into a monster years ago. I think it's important to go into your college years with an open mind, and focus on yourself, what you want in life. The running joke is when fans of the show ask, I tell them, especially the female fans, is I'm looking out for their best interests. Because we have to hire more good-looking men on the show. Caroline doesn't know yet that Bonnie is dead. So this is I'm sure going to be a big shock to her. She will have many emotions and feelings on that matter. But right now going into Season 5, she doesn't know that Bonnie is dead, she doesn't know that Stefan is in a coffin, and she definitely doesn't know that Klaus has a baby on the way. So Caroline has a whole bunch of stuff to learn in the next season! TV Guide's Comic-Con edition has released a ton of spoilers about the next season. First, the recovery of Sam will be a major plot point. Says Robert Singer,"When we start the season, Sam is quite ill. How he comes back from this is a real spoiler." Singer also revealed that Benny may return, but that Abaddon, if she returns, will not be played by Alaina Huffman. Dean and Sam will team up with Crowley because "there’s someone else who wants to take over the reins of Hell. That person is an enemy to the boys, so there’s a certain ‘the enemy of my enemy is my friend’ feeling between them." With Castiel now human, there's going to be an exploration of the former angels now on Earth, with Singer saying, "They’re not happy about being earthbound. They lost their wings, so while they have powers, they can’t teleport. Different factions will find each other." Misha Collins adds, "All these disgruntled former angels with a certain amount of power would make for a formidable army." I think at this point everybody wants to see what in the world is Karen doing. What mischief is she up to, how in the world did she become the head alien? What does that even mean? So yes, we will see Karen again and as always she’s up to no good, because I’m waiting to see something we’ve never seen from her and also a little interaction between our Charleston heroes and Karen takes a very unexpected turn. Bill (Stephen Moyer) decides to seek out Lillith (Jessica Clark) for advice on handling the escalating human-vampire crisis. Eric (Alexander Skarsgård), Pam (Kristin Bauer van Straten), Nora (Lucy Griffiths), Jason (Ryan Kwanten) and Jessica (Deborah Ann Woll) get up-close-and-personal looks at the perverse perils of Vamp Camp. Sam (Sam Trammell) comes to a decision he hopes will be in Emma’s (Chloe Noelle) best interest. Andy (Chris Bauer) gives his faerie daughter a name, or two or three or four. Arlene (Carrie Preston) has a solution to Terry’s (Todd Lowe) malaise, and Eric makes a startling discovery.